I HAVE HAD A NATURAL INCLINATION toward yoga since my early childhood.From the age of three or four, whenever I saw my father practicing, I would try to imitate him. I suffered from nephritis (kidney inflammation) during my early childhood, and I had to be hospitalized. After three weeks, I was discharged from the hospital with a long list of medications that I had to take. This was during a difficult period for my father, Yogacharya Sri B. K. S.lyengar, and he could not afford to buy the medicines. Instead, he recommended that I practice asanas to improve my health. Every time I went to see the doctor for a checkup, he would say that I was steadily improving and that I should continue taking the prescribed medicines. Of course he had no idea that my improvement had nothing to do with any medicines; it was purely the practice of yoga that was improving my health. 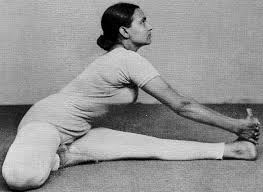 About a year later, my father took me to see his own guru, Sri T. Krishnamacharya,in Mysore. We waited two days to get an appointment to see him, and when we did, he suggested that I should practice the same asanas that I was already practicing.